Sometimes I get carried away. Really carried away. So in a staff meeting last week when the office manager asked who would pick up bagels for a breakfast meeting we were planning, I raised my hand and volunteered to make scones. For thirty. I went home and dug out my favorite scone recipe from cookbook of the Metropolitan Bakery in Philadelphia. My chief complaintabout most scones, is that they are too dry,but the scones from this recipe never are. I got started on recipe multiplying. The recipe said it made 14 scones, which Ivaguely remembered as being an underestimation from the last time I had made them, but I didn't want to take any chances. 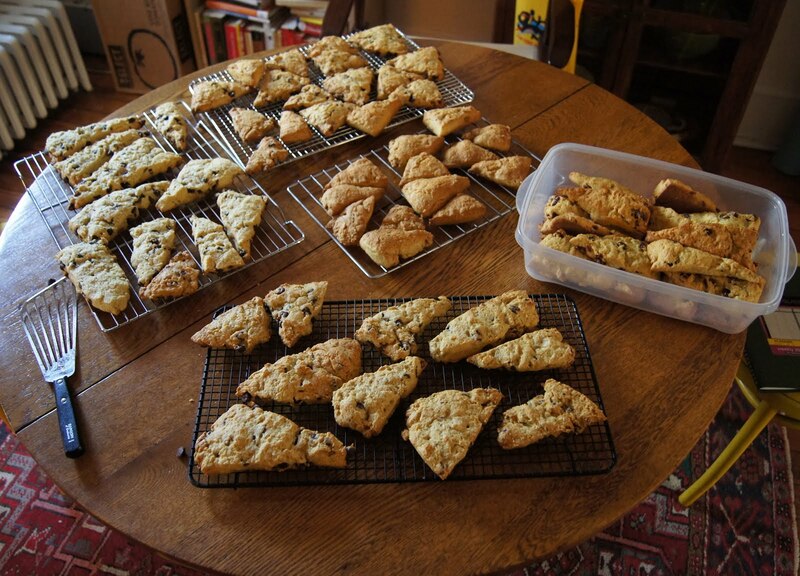 I wantedeveryone to be able to eat two scones (I knew I planned to eat at least three), so I multiplied by five, and proceeded to buy the requisite 20 cups of flour, 10 eggs, 10 sticks of butter, etc. I planned to do two batches of chocolate chip, two of cranberry, and one plain. When I got to baking, I realized the first downfall of the plan. The quantities in a single batch were large enough that only one would fit in my cuisinart at a time. So rather than mix the dough all in one go, it took five. Once the dough had chilled for a while, I realized the second downfall of the plan. Scones are best when fresh baked, so I had originally planned to chill the dough over night (which only improves scone quality, according to the book) and get up early to bake them before going to work. Once I had the dough flattened out and ready to chill, however, I realized that only I could only bake a fraction of the dough at once in my average sized oven, so to bake them all I would need to get up early enough to bake several batches (at 20-25 minutes per batch, this was a daunting prospect). I compromised by making one late in the evening, and three in the morning. (the fifth, a cranberry batch, is safely wrapped in freeze-tite in my freezer waiting for a scone craving to hit--it might be a while) and had over eighty scones. Needless to say, there were many left over after the breakfast meeting, and we've been eating scones in office for three days now. They were, however, delicious. Moist and just a little bit flaky. With a delicate orange flavor. The chocolate chips went the fastest. Plain were the next most popular. I guess next time the cranberry might not make the cut. Or I might try a different kind of zest, perhaps lemon. In any case, I'll certainly have a better sense of how many batches to make! The recipe below is for a single batch and makes about twenty scones. Adapted from the Metropolitan Bakery Cookbook Total time: 13 hours (assuming 12 hours of chilling time, 2 will suffice in a pinch) Sweetness Factor: 3 (in plain and cranberry) or 5 (in chocolate chip); Richness Factor 5 (in plain and cranberry) or 7 (in chocolate chip); Difficulty Factor: 4; Chance I'll Make Them Again: 10. Combine the first six ingredients in a cuisinart. If you don't have a cuisinart, whisk together in a large bowl. Cut up the butter into small pieces and add. If using a cuisinart, pulse until the mixture looks like a rough corn meal. If working by hand, use two butter knives or a pastry blender to cut in the butter. Stir in chocolate chips or cranberries. In a separate bowl, combine the buttermilk and eggs and whisk until well-blended. 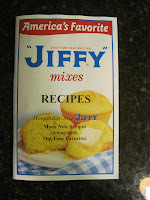 Add this mixture to the butter and dry ingredients and stir with a spatula until the dough start to come together. If you're making multiple batches, save yourself a hassle by dumping the butter mix into another bowl before adding the buttermilk mixture. That way, you avoid have to clean out the cuisinart between batches. Using your hands, clump the dough together trying to evenly distribute the moisture provided the buttermilk and eggs. Don't overmix. It doesn't have to be perfectly blended, and the more you mix the less flaky your scones will be. 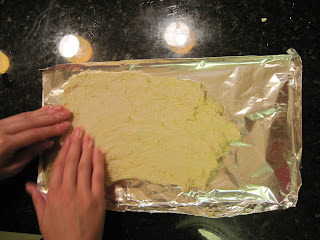 Dump the dough onto a piece of plastic wrap and press the dough out into a large rectangle just under an inch thick. My rectangles were about ten by twelve inches. Cover in plastic wrap and chill a minimum of 2-24 hours. The longer the better. Preheat the oven to 375. Unwrap the dough. Using a pastry brush, spread on a sparse coating of heavy cream. Cut the dough into triangles. A pizza cutter is a good tool for this, but any knife will work too. Lay the triangles onto baking sheets lined with parchment paper. Space about an inch apart. Bake 20-25 minutes until golden brown. If your scones are smaller, check on them around 18 minutes. Serve as fresh from the oven as possible. In August, there are few things I like better than fresh peaches, and, for the last few weeks, my farm share has come piled so high with delicious peaches, nectarines, and plums that I have really had no choice but to start putting them into everything. Sliced into cereal. Sliced up with a bit of mint for a mid-afternoon snack fit to make all my coworkers jealous. Sliced on top of some vanilla ice cream with chocolate sauce. Sliced into a green salad with a balsamic vinaigrette. All of these things are delicious. But when the pile is so high, there is really only one efficient option: bake. Crumbles have always been my fruit dessert go to. They are quick, can be made with whatever is in the cupboard, and lack the fussiness of so much pie (don't get me wrong, pie is great, it just never occurs to me to make it). 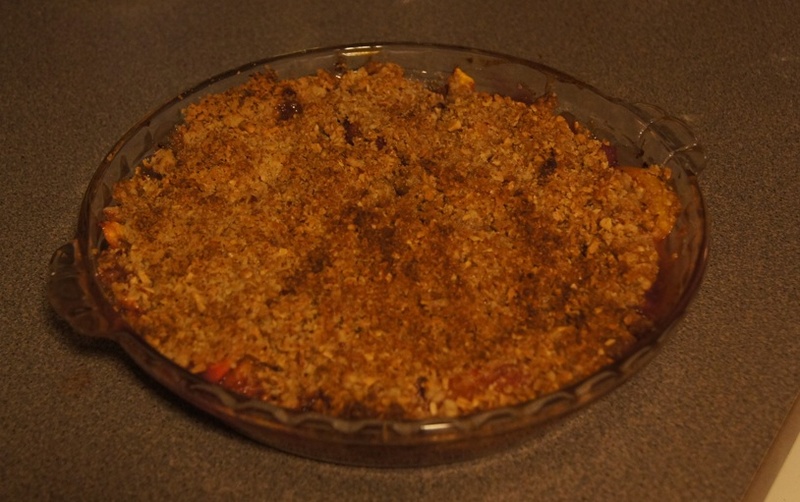 This crumble is particularly sweet, but because of the maple syrup, it isn't cloying. If you don't have a good real maple syrup on hand (I prefer grade B, but grade A dark amber will do as well), you could replace the maple syrup in the filling with sugar, but you might want to reduce the amount (in both the filling and crumble) just a bit. A few other replacement options: walnuts would be good in lieu of or in addition to the almonds. Lime might be interesting instead of lemon. A whole wheat flour in the crumble might lend an interesting savoriness, but you would want to cut down to 5 tablespoons. If the peach season has gone past by the time you get to this, the recipe should work just as well with apples. 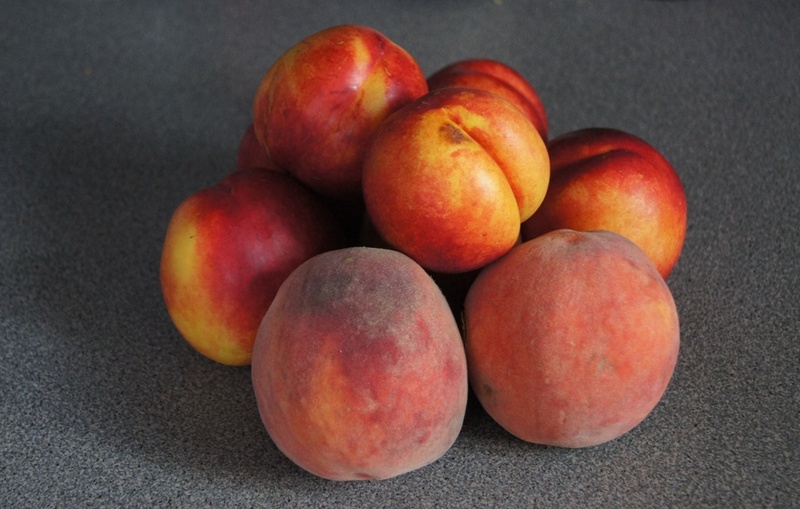 Note: if you're peaches aren't quite ripe you can speed up the process by storing them in a closed paper bag. If you don't have time for that, you can go ahead and bake with them, but add a few minutes of baking time and a little extra sugar. Preheat the oven to 350. Pit and slice the peaches. Some people prefer to peal them but I find this really not worth the trouble. Toss them in a bowl with the remainder of the filling ingredients and empty the contents of the bowl into a 9 inch pie plate. Put the first four crumble ingredients into a cuisinart (if you're using a mini you might need to do this in two batches). Pulse until the the almonds are finely-chopped (unless, of course, you like a crunchier crumble, in which case stop sooner!). 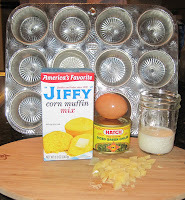 Cut the butter into 1 tablespoon chunks and add. Pulse until the mixture starts to resemble a course meal. Spread the crumble mixture over the peaches. Bake for about 40 minutes, until the crumble starts to brown and the peach juices are bubbling around the edges. Serve warm. In the last week I have made several eating missteps. The first came on Monday when I left two jars of peanut butter in my very hot car while I was at work. When I got back, one of the jars had come very close to exploding: the plastic bottom swelled outwards, and i could actually see some peanut oil starting to seep through the label. I was disturbed, but decided the peanut butter had probably just boiled. (It is REALLY hot in DC.) I didn't want to waste good pb, so I opened it and tasted it. It was a little funny, but I set it aside to try again later. The next day at work, I told my colleagues about what had happened. They all immediately leaped to a conclusion that hadn't even crossed my mind: contamination, and more specifically, botulism. Miraculously, I don't seem to have suffered any ill effects. Still, it was worrying. Then, two nights ago, exhausted, I pulled the broccoli I was microwaving out of the oven, only to discover that along with the broccoli, I had microwaved a rubber band. I ate it anyway. It tasted a little rubbery, but you know, I really wanted the broccoli. All of this is not to scare you off trusting my baking advice or even my baked goods. (I swear, I am willing to take far greater risks when I am the only one eating!) It is, however, to explain why I am not making the David Lebovitz whole lemon bars to use up the leftover lemons from my cake. 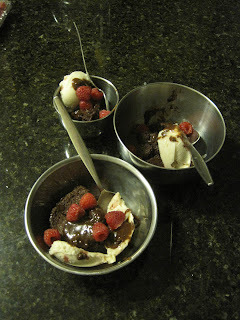 I love David Lebovitz, and when I read this recipe on his blog, I was determined to try it. Unfortunately, I am not sure that the lemons I bought are organic as he advises, and I didn't think I should risk putting any more strange chemicals in my body quite yet. Luckily, this week also featured an eating right-step; a friend at work gave me a lemon bar his wife had made, and it was delicious! It turned out she used a recipe from a cookbook I had gotten for Christmas, but not yet made anything from: Chewy, Gooey, Crispy, Crunchy, Melt-in-your-mouth Cookies By Alice Medrich. I am ashamed to admit I haven't heard of her, but the book is full of what look like delicious cookie ideas. I decided I'd use her recipe as my base. And I was pleasantly surprised to see how easy it was. No kitchen aid required! In fact, only one bowl is needed and you can mix everything up in about ten minutes. I did make some changes, though. I doubled it. (You can never have enough!) I also upped the sugar a little in the crust, since she herself admits her bars are very tangy, and I wanted a really sweet crust to play off that. I upped the vanilla too, because I don't think anything can ever be quite vanilla-y enough. As for the lemon topping: the changes I made to that were less intentional. I realized that I didn't have quite enough lemons to get three tablespoons, so I just used two. (And yes, as I was zesting, I did realize that if there were any icky chemicals on my lemons, they were in the rind, which I was now blithely putting in my bars despite all my intentions. Oh well, I guess this will all help me develop an iron constitution...) I didn't have enough fresh juice either, so I just supplemented with some reconstituted lemon juice I had in my fridge. Fine in a pinch, but I don't recommend you emulate me. Instead, just buy about 6-8 lemons. And make them organic. The result: Delicious! The topping tastes like a delicious lemon meringue pie, and I think it goes very well with the shortbread. The texture is lovely too: the topping is like a cross between custard and lemon curd. My only complaint is that they were a little TOO good. I ate quite a few and then felt very ill: the lemon can get really overwhelming. I recommend having plenty of hungry friends around before you make this. Sweetness Factor: 5; Indulgence Factor: 5; Difficulty Factor:2; Chance We'd Make It Again: 7. Generally, I shy away from box mixes. Their convenience almost never makes up for their lack of flavor and over-reliance on oil. Of course, there are exceptions (for instance, Annie's Macaroni and Cheese, without which I might have starved in college). 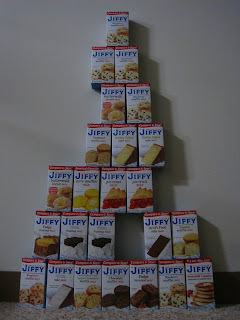 When my sister and I left our cousins' house in Grass Lake, Michigan, and drove past the Jiffy Factory in Chelsea, Michigan, we were so taken in by the nostalgic signage, bythe existence of a functioning factory in a town center, and by the possibility that there might be a gift shop, that we had to pull over. Our timing was perfect; we stumbled right into the start of a tour. Here is what I learned about Jiffy, the brand name of the Chelsea Milling Company. A four-generation family owned business, the company has always been located in Chelsea, which is just outside Ann Arbor and about an hour west of Detroit. 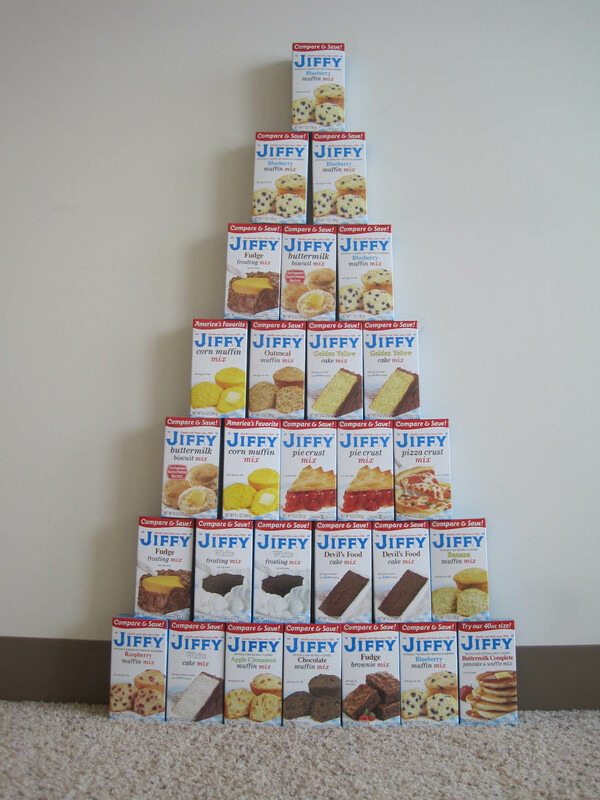 For its first forty years or so, the company milled flour, but, in 1930, Mabel Howdy, wife of the company's second president, Howard Holmes, invented the first ever box mix! Incidentally, she also briefly ran the company after her husband was killed in some kind of factory accident. but it is October to January, which, I suppose, makes a lot of sense), the factory produces 1.5 million boxes of mix per day, enough to build a two lane road from Chelsea to Chicago (which is about two hundred miles). 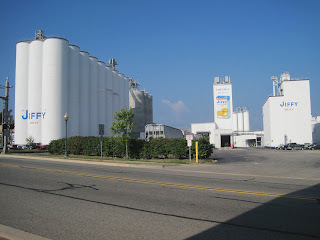 Those grain silos store over 1.25 million bushels of wheat, which are milled on site. At the end of the tour, my sister and picked up our prize. For 12 dollars, we got a case of 24 assorted mixes, plus free goody bags with recipe books and boxes of blueberrymuffin mix--the flavor of the month. and no ingredients like vanilla or baking soda that she wouldn't have occasion to use again. For a measuring cup, we used a jam jar with liquid ounce markings. And for baking dishes, we stopped at the Village Discount (an incredible thrift store if you're ever in Chicago) for an 8*8 and a mixing bowl (60 cents each). The muffin tin my sister had conveniently bought me as a gift at an estate sale. balance of chewy and crunchy. On to dessert, the chocolate pudding cake, our selection from the recipe book, was good in a more familiar and nostalgic sort of way. It tasted exactly like Swiss Miss. And the strawberry rice milk ice cream we ate it with tasted exactly like the scent of a Strawberry Short Cake doll. We certainly gobbled it up, but it didn't have an especially strong chocolate flavor. 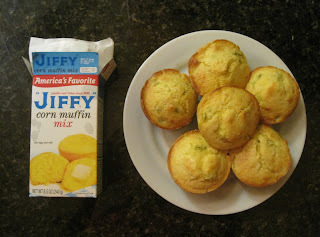 Jiffy Corn Muffins Total Time: 20 minutes; Sweetness Factor: 1; Indulgence Factor: 3; Difficulty Factor: 1; Chance We'll Make it Again: 10. Preheat the oven to 400 and butter six compartments in a muffin tin. Combine all the ingredients in a bowl and stir until combined. 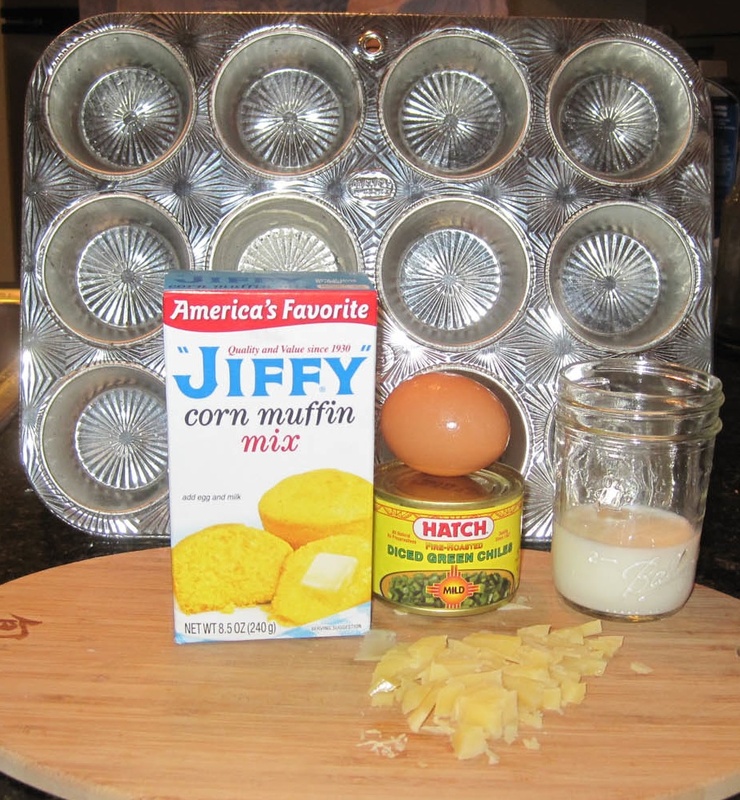 Pour into the prepared pan and bake until the tops of the muffins start turn golden brown at the edges. About 15 minutes. Jiffy Pizza Total Time: 45 minutes; Sweetness Factor: 1; Indulgence Factor: 3; Difficulty Factor: 3; Chance We'll Make it Again: 10. A few tablespoons of flour or corn meal for kneading. Get the onions going in a saute pan on low heat. Cook until they begin to wilt and add olive oil. Cover and cook, stirring occasionally for about twenty minutes. While the onions are cooking, preheat the oven (or gas grill) to 425. Combine the pizza crust mix with the hot water and stir. Let sit for five minutes. Dump onto a floured (or corn mealed countertop or board and knead several times. 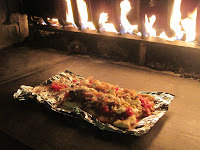 After greasing your fingers, spread the dough out onto a cookie sheet or a folded piece of tin foil. Don't forget to grease the pan or foil first (I skipped this step, and we had a hard time separating the hot pizza from the foil). Bake for a few minutes on each side, then add your toppings, and bake for another 10 to 15 minutes. Chocolate Pudding Cake Total Time: 45 minutes; Sweetness Factor: 9; Indulgence Factor: 8; Difficulty Factor: 2; Chance We'll Make it Again: 3. Preheat the oven to 350 and grease the 8*8. Combine the first three ingredients and mix thoroughly. Pour into prepared pan. Combine the remainder of the ingredients in a sauce pan and heat (on low), stirring frequently, until the butter is melted. Slowly pour mixture into the baking pan on top of batter. Bake for about 30 minutes. The cake will look down on top but the pudding portion will be bubbling up around the edges. Serve warm (I think this step is pretty critical) with your favorite fruit and ice cream.